Officially, the paper is legally non-binding, so it does not count. What would happen if it did, though? What if it was enshrined in the constitutions of European countries? After all, it was voted by the overwhelming majority of them, with only Ukraine, Russia and Georgia abstaining and according to the United Nations it does “represent the dynamic development of international legal norms and it reflects the commitment of the UN member states to move in certain directions”. Much of the document deals with the discrimination suffered by indigenous people due to imperialism or colonialism, nonetheless, just like any other declaration of the UN, it has the pretense of universality, it speaks for every indigenous people, thus including indigenous Europeans. Let’s go through the declaration. Article 8 is of particular interest and it reads:1)UN Declaration on the Rights of Indigenous Peoples counted for indigenous Europeans, United Nations 2007-09-13. Let’s apply this article to the context of Europe, mass migration from the rest of the world, and the attempt by the liberal European elite to build a “multicultural and diverse society”. Let us analyze the document point by point: “Indigenous peoples and individuals have the right not to be subjected to forced assimilation or destruction of their culture” and then confront it with the declaration of EU leader Frans Timmermans speaking about the rebellious Visegrad Group: “Any society, anywhere in the world, will be diverse in the future”.2)Timmermans: Central Europe has ‘no experience with diversity’, Politico 2015-09-24. Isn’t Mr. Timmermans violating the right of indigenous Poles, Hungarians, Czechs and Slovakians and forcing the destruction of their culture, by making it more diverse, hence less Polish, less Hungarian, less Czech and less Slovak accordingly? It gets uglier. Point two: States shall provide effective mechanisms for prevention of, and redress for any action which has the aim or effect of depriving them of their integrity as distinct peoples, or of their cultural values or ethnic identities. Key words: any action, aim or effect. Under this point, the entirety of the immigration policies adopted by Western European governments would be a violation of the human rights of indigenous Europeans as they have significantly changed the ethnic and cultural composition of European countries. Whether it was purposeful or not and it often was, the effect is observable. 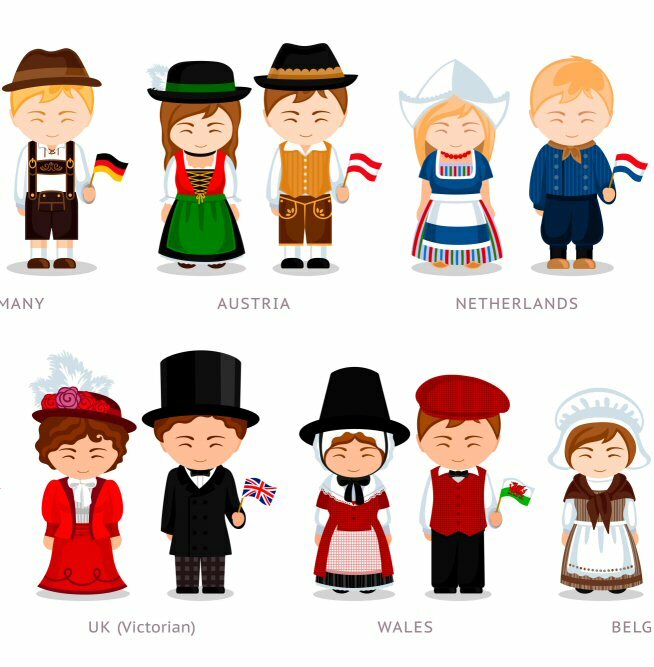 The current demographic trend for many Western European countries says that indigenous British will become a minority within their own country by 2066,3)White Britons ‘will be minority’ by 2066, says professor, The Telegraph 2013-05-02. followed by indigenous Dutch4)Cerberus 2.0 predicts with scientific precision the disappearance of the Dutch population Gefira 2017-06-05. and the Italians5)Come l’immigrazione sta cambiando la demografia italiana, Centro di Studi Politici Machiavelli 2017-07-18.; similar trends are observable all over Western Europe. The ongoing attempt by the Italian government to change the citizenship law from “Ius Sanguinis” to “Ius Soli” and naturalize 800 000 migrants overnight and an additional 50 000 a year could be in effect an additional violation of the rights of indigenous Italians to retain their cultural and ethnic identity. Let’s continue with the other items of the second point, which lists other policies states should refrain from: any action which has the aim or effect of dispossessing them of their lands, territories or resources: while in charge, former Swedish Prime Minister Fredrik Reinfeldt explained how he believed that Sweden did not belong to ethnic Swedes but to immigrants and he was basing his open border immigration policy on that belief.6)Reinfeldt: “Ett vägval vilket land Sverige ska vara”, TV4.se 2014-12-24.Wouldn’t it be another violation? Comma c: any form of forced population transfer which has the aim or effect of violating or undermining any of their rights: this could be once again applied to any form of replacement migration ongoing in Europe for the past decades, including Merkel’s open door policy, and in particular the agency of all those left-leaning parties that hoped they could replenish their voting base with mass migration and mass naturalization, all of which undermines the (voting) rights of indigenous Europeans. 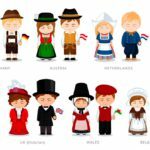 Comma d: any form of forced assimilation or integration; sometimes, you will hear pro-immigration advocates saying that natives should integrate with migrants and not vice versa. Wouldn’t this be another violation of the human right to an ethnic and cultural identity of indigenous Europeans? Comma e: Any form of propaganda designed to promote or incite racial or ethnic discrimination directed against them. 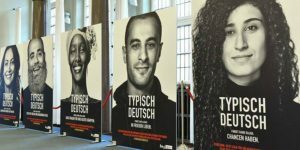 An ongoing propaganda in Berlin: Posters showing people with migrant background with a caption “Typical German”. 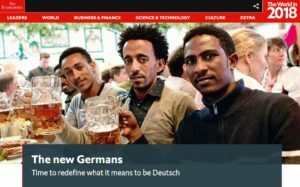 Similarly, not long ago Andreas Kluth, chief of the Berlin bureau of the Economist, wanted to “redefine what it means to be German”.7)The New Germans, TheWorldin2018. Echoed by former German federal president Joachim Gauck8)Wir können nicht jede Last tragen, General-Anzeiger 2015-05-28.. Article 9 reads: Indigenous peoples and individuals have the right to belong to an indigenous community or nation, in accordance with the traditions and customs of the community or nation concerned. No discrimination of any kind may arise from the exercise of such a right. Isn’t the propaganda piece a discrimination against the rights of indigenous Germans? Don’t they have the right to an ethnic and cultural identity? And to a nation? Article 9 says so. Or maybe ethnic Germans are inherently guilty forever of Nazi crimes and thus their only atonement is to disappear from history? Seems like it. It’s also ironic because such belief, not uncommon among left-leaning circles in Germany, to the point that Green politician Stefanie Van den Berg can plainly state in the German Parliament: ethnic Germans will become a minority in a supercultural society and that’s a good thing:9)Green politician Dr. v. Berg: Good thing that Germans will be a minority in “supercultural” society, Youtube.a reasoning that underlines negative connotations associated with the German ethnicity is the dictionary definition of racism. Interestingly enough, the original version of Article 7 called the violation of it “ethnocide” and “cultural genocide“. The wording was removed from the final draft10)1994/45. Draft United Nations Declaration on the Rights of Indigenous Peoples, UNHCR 1994.. So what would happen to the self-proclaimed paladins of human rights of the European liberal elite, should the UN Declaration on the Rights of Indigenous Peoples be applied to indigenous Europeans? The Poles, the Bulgarians, the Italians, the British and all the others? It does not matter whether they are the majority or minority. Those words aren’t even in the document. They would have a right to a land, an ethnic and cultural identity and the right to protect it. The Timmermans, the Verhofstadt, the Gaucks, the Kluths, the Macrons and all the other supporters of multiculturalism and mass migration could find themselves accused of ethnocide and cultural genocide. History will judge. 1. ↑ UN Declaration on the Rights of Indigenous Peoples counted for indigenous Europeans, United Nations 2007-09-13. 2. ↑ Timmermans: Central Europe has ‘no experience with diversity’, Politico 2015-09-24. 4. ↑ Cerberus 2.0 predicts with scientific precision the disappearance of the Dutch population Gefira 2017-06-05. 5. ↑ Come l’immigrazione sta cambiando la demografia italiana, Centro di Studi Politici Machiavelli 2017-07-18. Reinfeldt must be mentally sick, insane!! !